Oops. Wait. Wrong speech. That one was for 15 people at a Libertarian Party rally in Palm Desert. No, like any candidate, Hillary talked about the heartache and pain in the wake of the Zimmerman verdict, because she was campaigning for the US presidency in front of 14,000 black women of the Delta Sigma Theta sorority. And pretending to feel others’ pain is a Clinton family trait. Hillary also stressed that the Justice Department is looking into the Zimmerman case, and then artfully segued into a non-sequitur about the need for a national dialogue on race. I’ve been looking for that national dialogue for quite a while, and I can’t find it. Is there a pasture somewhere, where 300 million Americans are having a picnic and exchanging ideas on this sensitive subject? I know editorial writers for major papers hold the delusion they’re leading the dialogue, but we can write them off as psychotics living inside the Beltway bubble. I’m trying to catch up. I missed the national dialogue on drugs, the one on erasing the stigma of mental illness, and the one on guns. I heard a rumor they scheduled a national dialogue on poverty in Beverly Hills, but they had to cancel it at the last minute, because it fell on the one day a year it rained in Los Angeles. Hillary has had me baffled for a long time, ever since she wrote It Takes a Village. I looked for the village that raises a child, and I wound up in Mena, Arkansas, talking to three guys about CIA planes bringing in cocaine from Honduras. But who cares? Hillary’s back, and she’s the next president. Bill will be at her side, living in the White House, pacing the corridors, making deals, causing trouble. Then, after a quick shot of Secret Service Thorazine, he’ll wake up one morning and suddenly find himself in London, the Ambassador to England. Hillary and Bill are the worst of the opportunists. They’ve never met a group whose agenda they hadn’t already dedicated their lives to. If the Delta Sigma Theta sorority actually thinks Hillary is torn up over the Zimmerman verdict, I have condos for sale in the Orion Belt. 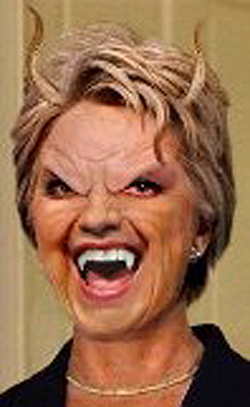 Official member or not, Hillary’s so far inside the pocket of Bilderberg, CFR, Trilateral, and the WTO, she picks lint off herself at the end of every business day. The day Hillary should lead any “national dialogue” is the day the sun sets in the east. If anyone in Washington cares about black murder victims beyond Trayvon Martin, they should consult the US Dept. of Justice report, “Homicide Trends in the United States, 1980-2008. This fact may be politically incorrect, but if our leaders are genuinely seeking to solve the problem, they should start there. What has the political establishment actually done about this horrific reality? Here’s a piece of truth, if it interests you. The history of federal and state aid to inner cities is an uninvestigated series of major felonies. Billions of dollars were supposed to fix education, alleviate poverty, reduce drug use, repair broken families, and create job opportunities. Yet since Lyndon Johnson launched the war on poverty and The Great Society, things have only gotten worse. Much worse. Any government executive worth his salt who wants to reduce violent crime would demand very specific answers to questions about where all that money went, who stole it, who diverted it, who torpedoed those thousands of programs. To the degree that you believe lack of education, poverty, drugs, unemployment, and broken families drive crime, you would naturally want these answers. But successive presidents have sidestepped the whole issue as if it’s made of plutonium. Because actually getting to the roots of the problem and solving it is not on their radar, no matter what pretty things they say. They say they care, but their actions don’t back that up. Oh, that’s right. I forgot. In the modern political landscape, actions don’t count, when push comes to shove. Only rhetoric does. Presidents Clinton, George Bush, Barack Obama. They fit the rhetorical bill. Hillary’s a natural in the same mold. From her you can expect vapid generalities that hold all the rainwater in the universe and deliver nothing but drought. Bonus: she’s a heavier psychiatric maven than any of her presidential predecessors. We can look forward to more fictitious diagnoses, more drugs, no help, plenty of induced brain damage. Happy, happy. It Takes a Bilious. To be president. This entry was posted on 18 July, 2013 in homepage and tagged Bilderberg, CFR, Delta Sigma Theta sorority, Hillary Clinton, Jon Rappoport, Racism, Trilateral, USA elections, WTO, Zimmerman. Bookmark the permalink.